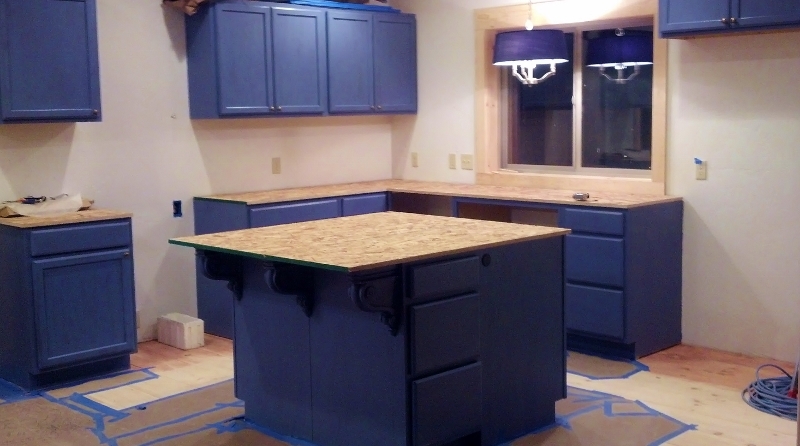 The kitchen cabinets are done. They have knobs on the doors and they are hanging straight. Our contractor did the frames and I did the rest. The knobs, when close to each other, actually do align.I am exhausted and glad that this task is over. Don’t take a sweeping look to take everything in or you will notice that from one cabinet door area to another the knob are not exactly the same. Cabinet hardware is notoriously difficult to install evenly. I used a template, carpenter square, roof rake tool (for diagonals), pen, pencil, sharpie, store-bought template, a hammer, screw driver and drill. I developed a method of taping across in multiple directions so that you could find the intersection point. Most of the time this worked but not always. The first cabinet door took the brunt of the mess. We could not get the knob on in the right place so I just kept drilling my hole bigger and bigger until I could find the right spot. It is now in the utility room, shamming hole filled with wood filler and painted. The knob is on what used to be the bottom side. We managed to sort two of the doors wrong so there are two with holes at the bottom because when they were in the right places the top was no longer the top. These too have filler and are awaiting some touch up paint. The important discovery, other than how hard it is to hang 17 cabinet doors, is that I have my mother’s cabinets. I got dizzy when I put one up with the hardware on and backed up to look. It was one of those dreaded moments when you not only see your parents in yourself, you see yourself doing one of those things you swore never to do. I swore never to try to “antique” cheesy blue painted furniture. The paint I originally picked was much darker than what I used because it was i the color family we were using already. My skill working with glazes showed too. I have very little. So, my mother’s cabinets. After a moment of panic I got my jar of black “antique” glaze our and had at the hardware. It was too shiny and even though it was definitively not cheap, it was too shiny. I made it look worse so everything looked better. Our hotel granite counter tops should go in later this week. When we have a sink that does not reside in a box in the mud room, we will have a kitchen. It’s coming together !! Looks wonderful !! Thank you for liking it. I am pretty surprised about how the Lowes bottom-feeder cabinets turned out. Our contractor really nailed them to each other and the wall so they are very sturdy. I am really happy to have them. Our cabinets and granite counter top together are going to be less than $2,000 which is about $10,000 less than usual.for a kitchen like this one. We have just discussed the plans for a house that is sort of similar and the kitchen is $45,000!